Lucy and Ricky enthusiastically accept friend Harry Bailey's invitation to spend a week at his vacant Vermont mountain lodge. Shortly after they arrive, Ida Lupino and Howard Duff turn up - it seems that absent-minded Harry extended similar invitations to both couples for the same week. The men decide to go fishing and leave the wives to amuse themselves with such chores as cleaning their daily catch. Bored, Lucy and Ida doll themselves up in their best evening dresses and try to woo their husbands into a romantic evening. When that fails, Lucy decides to drill holes in the bottom of the boys' rowboat. That way, they'll have to stay on shore and keep them company. Ricky and Howard, by this time, are feeling guilty about all their fishing expeditions - and decide to take their wives out onto the lake for an evening of moonlight and romance. Not even Lucy's strategically placed bubble gum can keep the punctured rowboat afloat. According to some reports, tensions ran high during the filming. Lucy became angry when Desi began flirting with Lupino. She was also angry with the director, Jerry Thorpe. 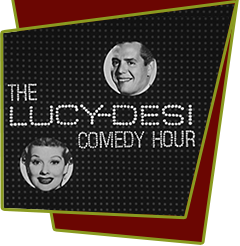 Lucy thought Lupino wouldn't be able to handle comedy and had mentioned it to Thorpe. He happened to mention Lucy's concerns to Lupino. Allegedly, Lucy was angry about his betrayal of confidence and walked off the set until he was replaced. Desi ended up directing the remainder of the episode.